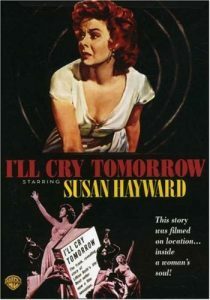 Susan Hayward has a signature role in I’ll Cry Tomorrow, a pedal-to-the-metal look at the troubled times of singer Lillian Roth. Hayward snagged her fourth Oscar nomination for the part, which takes Roth from humble beginnings through great stardom and finally into a hell of alcoholism and recovery. The movie delivers on a couple of tendencies of its era (1956): a fresh frankness about addiction (The Man with the Golden Arm had come out the year before), plus some handy psychoanalyzing of the heroine–in this case, Roth’s problems are laid at the feet of her pushy stage mother (Jo Van Fleet). Lillian Roth (Susan Hayward): OH! Look what ya did! And ya DID IT ON PURPOSE! You’re still trying to make me do what you want, to be what you want! I can’t be anything except what I am! Look, look what did you drop that bottle for? What are you trying to do, drive me crazy? Go on, Get the bottle! Get it now! Katie Roth: All right! All right! All right, it’s my fault, huh? I made you become an actress, you didn’t want to, all right. I’ve been a bad mother, you had to support me, all right! All right! All right, everything! Just this, and for once in your life you’re gonna hear it! Do you know at all why I did it, do you? No you don’t! Do you know what kind of a life I had, do you know what it was like to live with your father, put up with his mistakes and afterwards to be left alone with nothing? No money, no career, not young anymore, nothing to fall back on? No you don’t! You don’t know at all what I tried to save you from, the kind of freedom I never had! I tried to give to you by making you Lillian Roth! Lillian Roth (Susan Hayward): So you admit it! You invented Lillian Roth! All right, now look at me. I said look at me, don’t turn your face away! I’m the looking glass you created to see yourself in! All right, all right see yourself now in me! Look at this ugly picture! And then get outta here! But keep this picture before your face for as long as you live! Katie Roth: It’s true! Oh, God help me! I owe you this. Every single word of it is true. Lillian Roth (Susan Hayward): What I’m doing now is ‘wrong’… and I’m ˆ it!